The firm through Mr. Ansar has extensive experience in the project financing of infrastructure projects, including power projects using LNG, coal or fuel oil as fuel, renewable energy (hydro, wind and solar), and water projects, and competitive bidding for such projects, whether through Public-Private Partnerships or otherwise. Representation of NRG Energy in connection with a bid for the Taweelah A1 Power Project. Representation of a U.S. investor in connection with an investment in the Wiggins Island Coal Export Terminal in the Port of Gladstone, Queensland. Representation of Entergy Power Group, Irvine, California, in connection with the development and financing of a 350 MW cogeneration project in Bina, Madhya Pradesh. Representation of Entergy Power Group, Irvine California, in connection with the development and financing of a 400 MW coal-fired power project in Bakreshwar, West Bengal. Representation of a European developer and manufacturer of diesel engines in connection with the development of a fuel-oil fired 120 MW power project in Madhya Pradesh. Representation of the Dabhol Power Company, and its sponsors Enron Development Corp., GE Capital and Bechtel Enterprises., Inc, in connection with the financing of a 740 MW power plant in the State of Maharashtra, India, aggregating approximately $1 billion, including the closing of Phase I of the financing of the project, involving U.S. Eximbank, Overseas Private Investment Corporation, commercial bank financing provided by Bank of America and ABN AMRO Bank N.V., and others (that replaced a Rule 144A bond offering led by Lehman Brothers) and Rupee financing provided by a syndicate led by the Industrial Development Bank of India ("IDBI"), and comprising IDBI, the Industrial Credit & Investment Corporation of India, the Industrial Finance Corporation of India, State Bank of India, Canara Bank and Bank of America, and the subsequent reinstatement of the project following it's cancellation and renegotiation. Representation of KLT Power, Inc., a subsidiary of Kansas Light and Power, Inc., in connection with the development and financing of power projects in three states in India. Representation of Smith Cogeneration in connection with the development of two barge mounted projects of 150 MW each in Karnataka. Representation of an Indian business group in connection with the development of a 330 MW naphtha-fired power project in Madhya Pradesh. Representation of Ballarpur Industries Limited, New Delhi, the flagship company of The Thapar Group, in connection with the development of a 440 MW lignite-fired power project in Rajasthan. Representation of CMS Energy in connection with the development of a 420 MW coal-fired power project in West Bengal. Advice with respect to the structuring and formation of two funds for investment in infrastructure assets in India. Advice to a UK party in connection with the development of an infrastructure project in Saudi Arabia. Representation of an Indian Group in connection with the development of a steel project in Jizan, Saudi Arabia aggregating approximately $3 billion. Advice to an Indian chemicals company in connection with the development and financing of a specialty chemicals project in the Kingdom of Saudi Arabia. Advice to a Kuwaiti party in connection with the privatization of the Sulaibiya water project in Kuwait. Representation of NRG Energy, Inc., in connection with the recovery of a performance bond from the Government of Pakistan for a 450 MW coal-fired power project in Punjab. Representation of Enron Development Corp. and Bechtel Enterprises, Inc., in connection with the development and financing of a 780 MW fuel-oil fired power project in Multan, Punjab. Representation of a U.S. developer in connection with a proposed investment in a 330 MW fuel-oil fired power project in Sindh. Representation of NRG Energy, Inc. and its Pakistani partner in connection with the development and financing of a 480 MW fuel-oil fired power project in Sheikhapura, Punjab. Representation of Oxy Power Ventures, a subsidiary of Occidental Petroleum, in connection with the development of a 150 MW power project fired by indigenous natural gas and condensate in Badin, Sindh. Representation of a U.S. developer in connection with a proposed investment in a 140 MW gas-fired project in Kabirwala, Punjab. Advice to a major U.S. natural gas company in connection with the development of pipelines and related infrastructure for the transportation of naphtha and LNG in Pakistan. Representation of the Fauji Foundation in connection with the acquisition and divestiture of Exxon's interests in the oil and gas sector in Pakistan, including a gas field supplying gas to the fertilizer sector in Pakistan. Representation of the Fauji Foundation in connection with the development and financing of the Mari Gas field in Baluchistan by the International Finance Corporation. Representation of the Aga Khan Hospital and Medical College in connection with the development and financing of a $500 million teaching hospital and university in Karachi, one of South Asia's largest such facilities. Representation of a Pakistani contractor in connection with the development and construction of a water treatment plant for the Karachi Development Authority in Karachi. Representation in Pakistan of a substantial U.S. based energy infrastructure company in connection with the development and financing of a gas-fired combined-cycle power generation and desalination plant with a nominal capacity of 94MW and three million gallons per day. Representation of the sponsors of a $350 million plant for Qatar Fuel Additives Company (QAFAC), in Messaieed, for the production of methanol and methyl tertiary butyl ether (MTBE). Representation of KHD Humboltd Deutz as lead sponsor in the development and financing of a 40MW project in Sapugaskanda, the first such project to reach financial close in Sri Lanka, financed by the International Finance Corporation and certain other financial institutions and export credit agencies. Representation of a U.S. developer in connection with the development of a 400MW power project in South East England. Representation of Merrill Lynch as underwriter of a $100 million offering of municipal bonds to finance the development of water treatment facilities in Puerto Rico. Representation of Merrill Lynch as underwriter of a $300 million offering of bonds for the Province of Newfoundland, including the proposed financing of offshore oil and gas assets. Representation of a Caspian-based investor in connection with a proposed investment in an oil and gas services company based in Oklahoma. 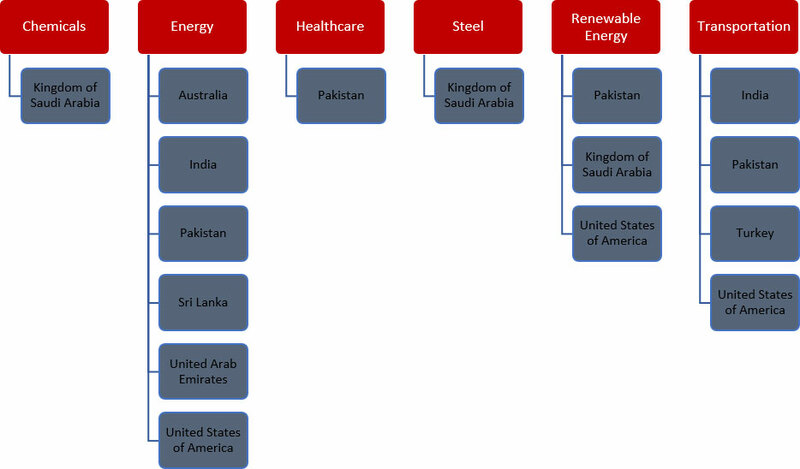 Representation of a U.S. developer in connection with the development of power and renewable energy projects in the United States, the Middle East and South Asia. Representation of a U.S. developer in connection with an agreement with a leading European developer for the development of projects in Latin America. Advice to a prospective development group in connection with the development, financing and operation of a renewable energy project in South Asia. Advice to a developer in connection with the formation of a bidding consortium for investment in a renewable energy project in an Asian jurisdiction. Advice to prospective investors in connection with an investment opportunity in Western Europe. Advice to a governmental authority in connection with a procurement process for a renewable energy program in the Middle East. Representation of a U.S. developer in connection with the development and financing of various renewable energy projects in an Asian jurisdiction. 1Definition from the Federal Highway Administration, available at https://www.fhwa.dot.gov/ipd/p3/faqs/. In the last 36 years we’ve been involved in or executed transactions involving substantially all of the variations described above. Note in particular that Public Private Partnership models involve the assumption of more risk by the private sector with greater involvement than the traditional Design-Build and Design-Bid-Build models.